Vithanco stands for “Visual Thinking and Communication”. What does it mean? I have experienced that visual focus helps me thinking. Without a focus it’s difficult to concentrate. Sometimes I only need to start writing. But most often I start drawing. It’s like the old proverb “a picture says more than a thousand words”. The same is true for the outcome: the diagram/picture I drew tells more than a long paragraph. Most times I draw boxes and connect them. Only by putting concepts into relation to other concepts does the structure of my thinking become really clear to me. Then I realised that the paper is soon getting to messy because the diagram evolves. So, in the past I tried software like Visio and I realised that I spend too much time wondering about the layout instead of focusing on the content. You add a box somewhere and suddenly you need to rearrange large pieces of the previous drawing which is used as a welcome distraction. wouldn’t the nodes all look the same. The second point is particularly important. Flying Logic was written to support the Theory of Constraints (TOC) Thinking Processes. But these are tricky to learn without guidance. And Flying Logic didn’t give that guidance. Actually, that is not completely true. It comes with a long and useful document on the matter. In any case, I needed more flexibility. Hence, I created my own software. 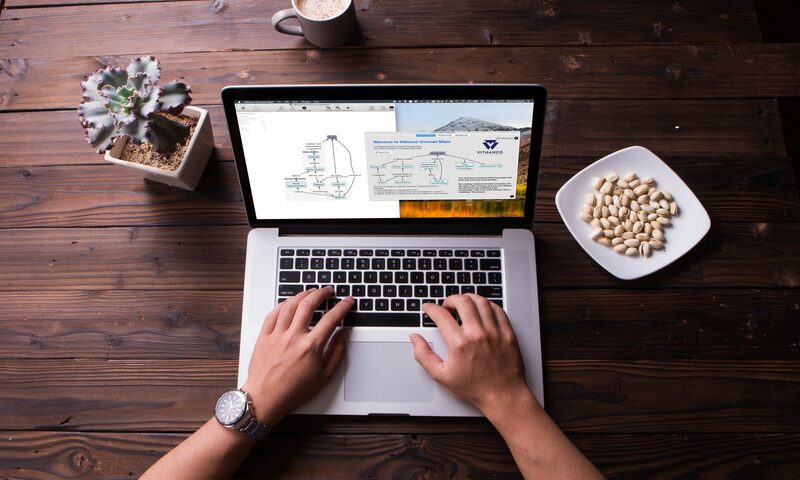 Use any Vithanco application and you will see that it supports you to focus on the content and creates beautiful diagrams. Vithanco uses “Domains” to define a visual language that restricts the diagram to a “valid” graph. So, if you are working on an IBIS diagram you will only be offered the suitable IBIS nodes for the given situation. This results in less distraction as I don’t need to think about the structure any longer. I can truly focus on the content. And yes, I try not to have a minimal user interface – the application itself shouldn’t distract you neither. And if the content is right the ideas will come through more easily. Try it out. Communicate your ideas to someone based on as simple diagram. They will grasp your ideas faster as they can use eyes and ears to follow you and to understand you. Previous PostPrevious What can you do with Vithanco?